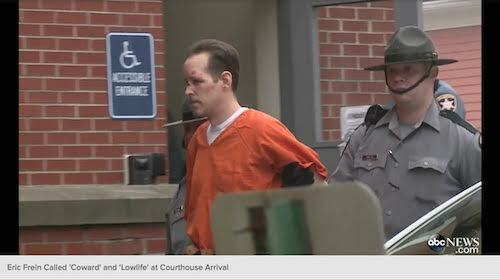 Eric Frein as he is taken into the courthouse. Image courtesy of ABC News video footage. 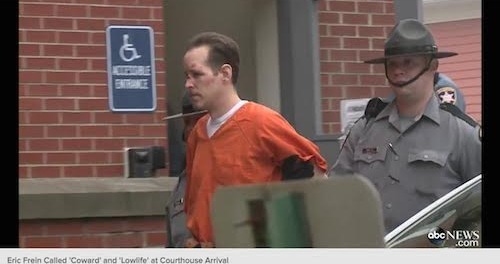 PENNSYLVANIA – Pike County’s District Attorney Ray Tonkin is seeking the death penalty for Eric Frein, according to an ABC News report issued on Oct. 31. NJ Inside Scene, which was one of the local sites that shared the news in this area, reported last night that Frein was captured in a hangar. Authorities have since further stated that Frein was found in the Birchwood-Pocono Airport in an abandoned hangar on the evening of October 30. According to reports, he was unarmed at the time of his capture, and was told to drop down, and raise his hands. He was said to have done so without resistance. Reports have also stated law enforcement cuffed Frein with handcuffs that had belonged to Cpl. Bryon Dickson, the Pennsylvania State Trooper that he murdered during an ambush on the Blooming Grove State Police Barracks on Sept. 12. He also injured another trooper Alex Douglass, during his shower of gunfire on the barracks. He was reportedly transported to the Pike County Correctional Facility in Dickson’s patrol vehicle. The manhunt for Frein lasted 48 days and rocked the communities surrounding the Blooming Grove area, where schools were shut down and residents on lockdown. Click below to view ABC News footage of Frein arriving at the courthouse. NJInsideScene.com will continue to follow this developing story. Click here to follow us on Facebook.